Pat Spillane and Joe Brolly (inset). Pat Spillane has opened up on working with Joe Brolly, saying that he and the former Derry star are 'acquaintances' rather than friends. The outspoken duo have worked alongside each other on RTÉ's Gaelic football coverage for over a decade, enjoying many robust arguments over the years. 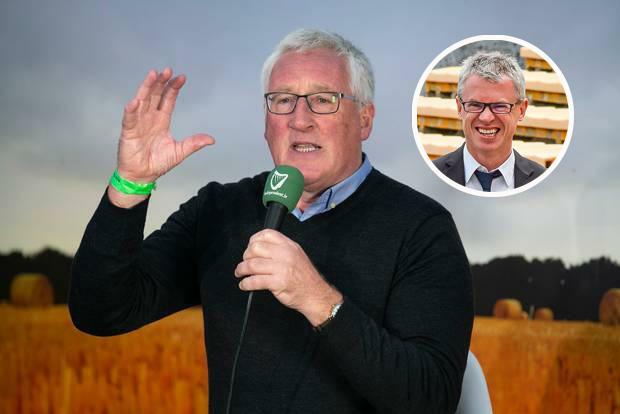 Spillane was a guest in the Irish Independent tent at the Ploughing Championships this week and was asked about his relationship with Brolly. The eight-time All-Ireland champion admitted that he and his colleague have more of a professional relationship than a friendship. "I thought I'd get away without talking about Joe but it's the only question that anyone asks me!," Spillane said. Spillane added that Brolly loves to argue his point whether he is in the right or not, and paid tribute to the barrister's intellect. "He is a genius, an absolute genius," Spillane said. "Sleeps 2-3 hours a night. He is restless. You couldn't insult him. Think of the worst thing to say to him but as long as Joe is the centre of attention, it doesn't matter if the publicity is good or bad. As long it is about Joe, Joe is happy!" The Kerry legend also hit back at the contention that himself, Brolly and Colm O'Rourke appear too often together on matchday panels, and that new blood is needed. "The narrative nowadays is that RTÉ need fresh faces," Spillane. "Do you know how many live shows myself, Joe and Colm did this year together? Two."